The 2015 Jay Bilas Skills Camp is in the books and was once again a success. With 78 players from 10 different states in attendance, the 2015 camp combined the personalized teaching of Jay Bilas and a staff of experienced coaches with team concepts that were drilled and practiced as well as implemented into game situations. For 3 days at Queens University in Charlotte, the young men involved in the Jay Bilas Skills Camp pushed themselves beyond their limits in the game of basketball and developed relationships with other players and their coaches that will last a lifetime. 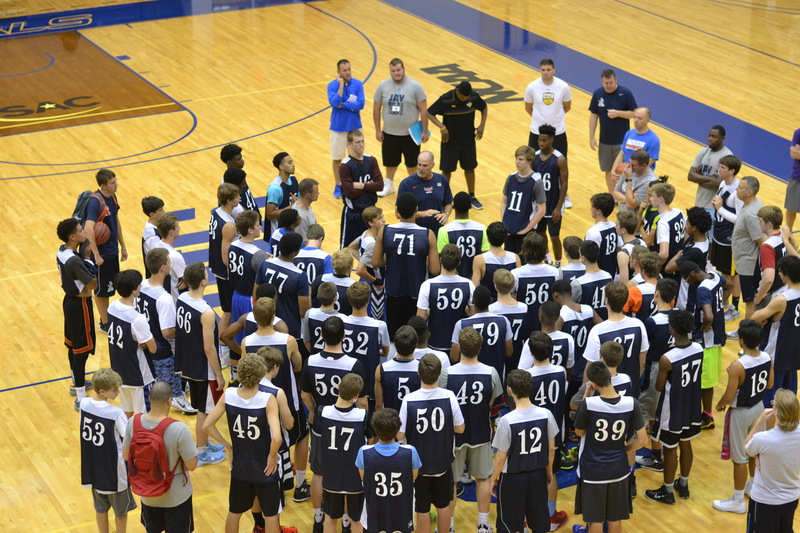 The Jay Bilas Skills Camp is designed to be an “old school” skills camp, and the 2015 edition did not disappoint. Each morning started with a warm-up and physical training by renown strength and conditioning coach, Alan Stein. Next came individual skill instruction in stations led by the camp coaches. Camp coaches included 3 current college head coaches, 4 former college head coaches, and 2 coaches with professional playing experience, along with Jay Bilas and Paul Biancardi from ESPN. Stations focused on the individual skills required to be a great team player – moving without the ball, shooting, defense, full court one-on-one, half court offensive moves, and Finishing School, where players work on taking the ball strong through contact to score. Each afternoon, the camp was treated to instruction on the principles of motion offense by Lane Odom, a 20 year veteran of the college coaching ranks. In 3-on-3, 4-on-4, and 5-on-5 breakdown drills, players learned how to move the ball, use the pick and roll, pass and cut, and score out of a traditional motion offense. Afternoons also held the camp skills competitions which included Hot Shot, Free Throw Shooting, and 1 on 1. The evening session was reserved for 5 on 5 games. Campers transferred the skills they learned from the morning and afternoon sessions to their game competitions that were refereed by collegiate officials and observed and evaluated by Paul Biancardi, ESPN Director of Scouting. Every team battled and the games were nip and tuck every night. No team made it through the round robin undefeated and there were 8 games decided on the final shot. It was obvious that the instruction from the individual and team sessions was carrying over as there was very good basketball being played on all three courts of the beautiful Levine Center on the campus of Queens University of Charlotte. Over the 3 days of camp, players not only developed on the court, but also were treated to some fantastic teaching sessions on how to succeed off the court by a variety of guest speakers. The camp truly focused on developing as a complete person and the importance that plays in your game. After just two years, the Jay Bilas Skills Camp has quickly become one of the premier basketball skills camps in the country. Few camps combine the level of skills instruction, team principles, and competitive play like this camp and we are proud of the growth that players who attend experience. If you are interested in attending the 2016 Jay Bilas Skills Camp, check back here regularly as we will post the dates and other information as soon as they become available.